New York genealogist Alex Friedlander has provided a a great deal of information for this book about various families, particularly those living in what was once Suwalki Guberniya - southwest Lithuania/north-east Poland. Records of the families,Altshuler, Bardin, Charlap, Frank, Friedlander, Kantorowitz, Lapin, Margolis, Shatz, Visanska, Warszawsky, Wishtynetsky, Winstock, Ziv, and many others, show a phenomenon of considerable intermarriage between them. 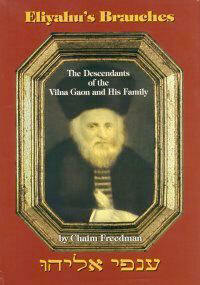 Furthermore, the families shared an often repeated oral tradition of descent from the Gaon of Vilna. Yet the exact nature of the Friedlander family's descent from the Gaon has yet to be documented. From the available evidence researched by Friedlander, it seems highly likely that the link with the Gaon was through the Gaon's son Rabbi Yehudah Leib of Serhei, since his family had a considerable number of marital ties in the region where the Friedlander family lived, the town of Versbolova (known also as Virbalin). The generation of the Friedlander family which is relevant to a marital link with the Gaon's son Yehudah Leib of Serhei is that of Yitskhak Friedlander of Versbolova, who was born about 1785. Yitskhak's wife Golda was most probably a daughter of Yehudah Leib of Serhei. Other branches of the Friedlander family that also hold a tradition of descent from the Gaon were compared to Friedlander's family by genetic testing and found to be unrelated and should be deleted from the database of the family of the Gaon. Further details follow. Despite the lack of documented evidence, this author included the Friedlander family in Eliyhau's Branches, so that, should such evidence be forthcoming in the future, the family will be able to take its rightful place on the family tree of the Gaon of Vilna.